Recurring/repeating reminders for appointments are easy with GoReminders. Setup takes 10 seconds and you'll be sending recurring text message reminders and recurring email reminders. Works for any kind of event and reminder message template. Try this appointment scheduling software for free, or read more below. The best repeating appointment reminder app and service, no training needed. Simple and automatic. Recurring text reminders and recurring email reminders. 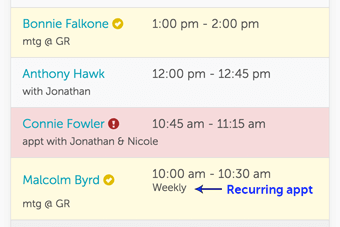 GoReminders is the easiest appointment scheduling software for recurring appointment reminders and recurring event reminders. These reminders are for recurring appointments that repeat on an ongoing regular basis. These reminders are also called repeating appointment reminders or reoccurring appointment reminders. Whether you call them recurring or repeating or reoccurring, they're super easy to do in GoReminders. All you do is choose a repeating interval when you enter an appointment for your client or customer in the GoReminders calendar reminders system. The interval is how often you want an appointment to occur. That's it! The reminders will automatically be sent out via recurring text message or recurring email reminders on that schedule. For example, if you have a client who has a weekly appointment, you just create the appointment ONCE and your customer will be reminded AUTOMATICALLY EVERY WEEK! It's the same process for monthly reminders, bi-weekly reminders, reminders every 3-8 weeks, bi-monthly reminders, quarterly reminders, bi-annual reminders (every 6 months), yearly reminders, or reminders every 2 or 3 years.